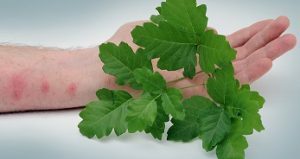 Recently reported by PittWire, many people have suffered through an itchy skin rash after a brush with poison oak, wearing jewelry containing nickel, or using latex gloves. That rash is one of the several symptoms caused by allergic contact dermatitis (ACD), a common skin condition that also causes blistering, ulcers, and cracking skin, among other ailments. Topical creams and ointments can relieve symptoms, but they do not treat the underlying causes. Researchers at the University of Pittsburgh may have hit upon a better treatment. In a paper recently published in the Journal of Controlled Release, McGowan Institute for Regenerative Medicine affiliated faculty members Steven Little, PhD, chair of Pitt’s Department of Chemical and Petroleum Engineering, and Louis Falo, MD, PhD, chair of Pitt’s Department of Dermatology, and colleagues propose that the underlying causes of ACD can be remedied by manipulating T cells, which control inflammation. The researchers manipulated cells to release proteins, immune system molecules, and other compounds to suppress destructive hypersensitivity responses to allergens that cause skin rashes, effectively preventing or reversing ACD in previously sensitized mice. Dr. Little said other researchers are trying to solve this problem by administering drugs that suppress the immune system, but side effects are a concern. Another treatment method under investigation takes cells out of the body, manipulates them, and then reinjects them. The difference between these methods and the one proposed by Dr. Little and his colleagues is that it appears possible to induce the body’s own cells to treat the disease by manipulating cells inside the body with proteins that promote T cells to divide and react to allergens more quickly and aggressively to better control inflammation. Researchers also said this approach to what is known as in vivo T cell induction could also aid in the development of new therapies for transplant rejection and autoimmune diseases. “It has the potential to do all of this without the side effects you’d normally see,” Dr. Little said.